Volunteering, events, fostering and supporting from your workplace - the possibilities are endless! Do something amazing for animals in need. As a charity, we receive no government funding and rely solely on the generosity and kindness of people like you. Every single penny you raise and time you give will help the animals in our care who desperately need support and protection. The animals never stop needing us and we never stop needing you. How can you get involved with Mayhew? Are you interested in volunteering with animals? Lots of events for you and your furry friends. Could you offer a temporary home to a cat or dog in need? 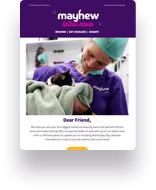 Adopt Mayhew as your charity of the year and give back to the community. From fun runs to abseiling, we have a challenge for everyone. Support animals from the comfort of your own home. Could your workplace support us? Can’t give any time? You can always help with a donation.